The power of Spotify is its expansive database of music that you can stream on your desktop or with a premium account, a mobile device. 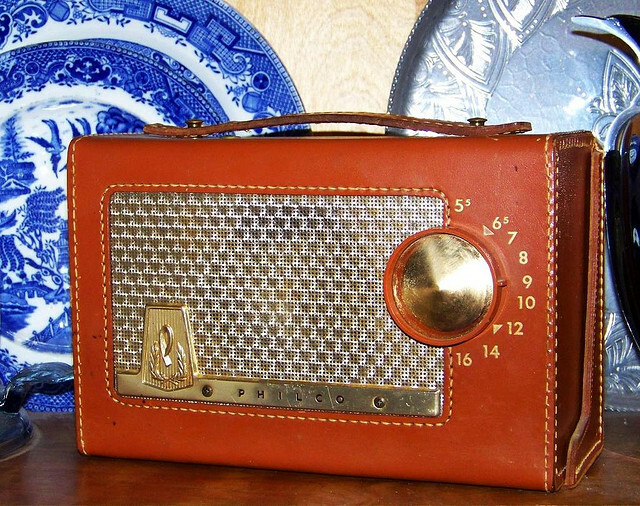 You’ll be extremely hard-pressed to not be able to find a particular track or musician that you like on the service. As the company is turning itself into a music platform complete with its own app store and public API, more and more great apps are popping up around listening to tracks on Spotify. One absolutely gorgeous app is called SpotON Radio and it’s available for iOS. 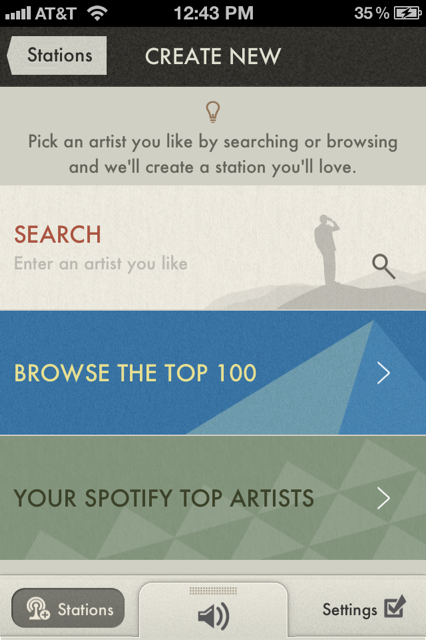 The premise is simple, you enter an artist that you like and the app uses the popular Echo Nest API to create a radio station of songs that are similar to the artist you chose. 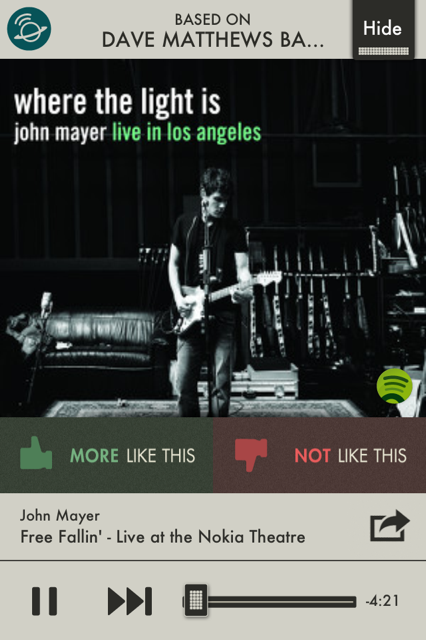 This functionality might sound familiar, as it’s exactly what Pandora has done quite well for years. 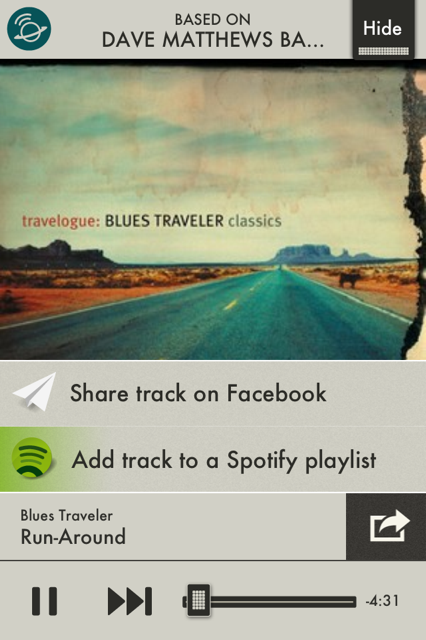 The difference between an app like this and Pandora is that you can save tracks to your existing playlists or create new ones, since the app is built around Spotify. You must have a premium Spotify account to use the app, so if you’re still on the fence about dropping down $10 a month, SpotON might change your mind. 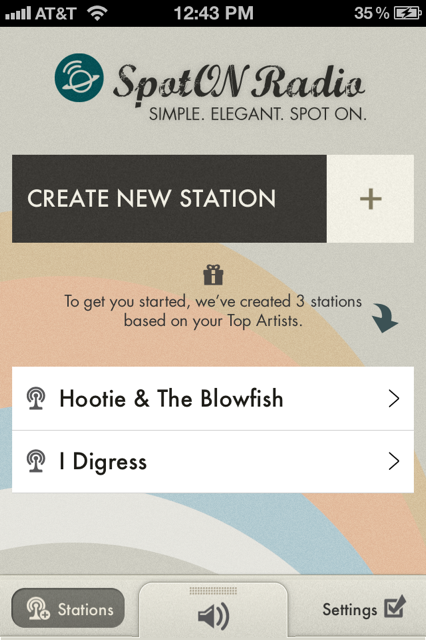 When a station is created, you’ll be able to do a few things with it; save it as a Spotify playlist, thumbs up and thumbs down tracks to help the app choose music for you, and share your stations on Facebook. The app itself is beautifully designed and having used it for a better part of the day, I can see myself not using Pandora as much since being able to find new tracks and save them directly to a Spotify playlist is something I just can’t do with Pandora. The great part about jumping between tracks is that you don’t have the constraints that Pandora puts on you by limiting how many times you can jump ahead to the next track. The app is currently free but hints on its app store copy and website that it could have a cost associated with it in the future. While I would highly suggest this app even if it cost a few bucks, the fact that its free makes the download an absolute no-brainer. Again, if you haven’t picked up a premium account for Spotify, you’re really missing out. SpotON is just one way a seemingly infinite database of great music can be put to use in a whole host of ways.